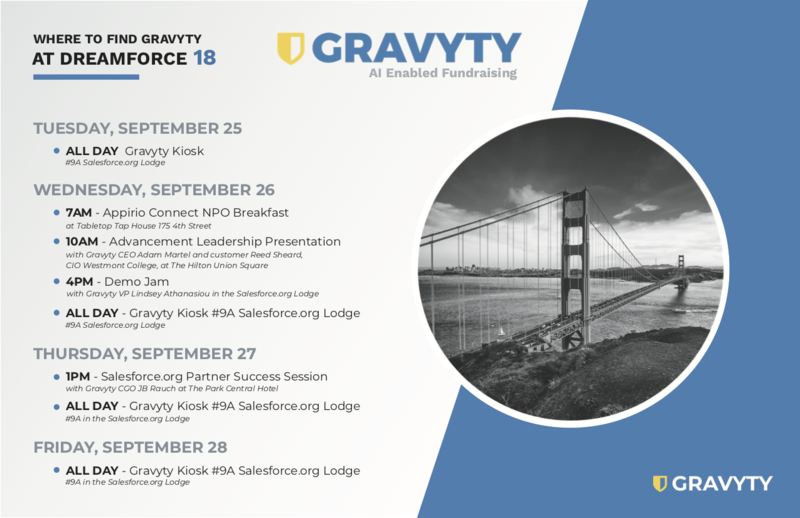 As a new Salesforce.org ISV Partner, and now with the Gravyty Connector live and featured in the AppExchange, Gravyty will have a major presence at Dreamforce 18, Salesforce’s annual user conference in downtown San Francisco. From multiple speaking sessions – including AI early adopters like Reed Sheard, CIO of Westmont College – to co-hosting the Appirio Connect Nonprofit Breakfast, presenting at the Demo Jam and a kiosk in the Salesforce.org Lodge, there are many opportunities to connect with our team and hear how we’re ushering in the future of fundraising with proactive AI applications. Additionally, if you’d like to set a one-on-one meeting, use the button below to request time from the team. See you in SF!